The Reno Air Races have been thrilling spectators for years. In this scene, commemorating the event’s 30th anniversary, two of Reno’s greatest champions are shown nearly scraping paint after rounding the pylons in Sunday’s Gold “Unlimiteds” class race. Rare Bear the legendary F8F Bearcat, in its vintage orange & white paint scheme, still to this day holds the record for the fastest piston-driven airplane, and was flown for years by racing great Lyle Shelton. In its familiar red, white and blue colors and shining silver nose is the highly-modified P-51 Mustang, Strega, flown by many-time champion Bill “Tiger” DeStefani. 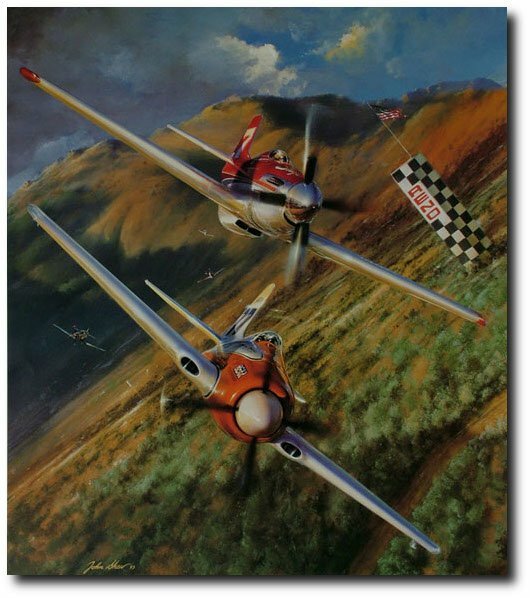 The Unlimiteds was painted in 1994, and was one of John Shaw’s very first aviation paintings. The original mixed-media / gouache painting was first unveiled in September of that year during Air Race week, at the opening of the National Museum of Racing in Reno, Nevada. Published in Reno by a small, independent company as an open-edition poster and limited-edition lithograph, this image remains one of the all-time favorites of this subject ever produced. In 2009 ,John released an all-new canvas giclee reproduction of this classic, so for the first time this classic can be enjoyed in the same large size and vibrancy as the original.